Montplaisir is a stone country house in southwestern France located in a private forest about 15 minutes by car from the medieval village of Mirepoix. This 14 acre property is about an hour and a half from Toulouse, about an hour from Carcassonne, an hour and a half from the Mediterranean and about 3 and a half hours from Barcelona. The house is close to airports (Toulouse Blagnac and Carcassonne) and train stations (Toulouse Matabiau, Carcassonne and Pamiers.) Lac Montbel, only a few minutes by car, offers swimming, horseback riding, sailing, bicycling and a restaurant in the summer months. The house was recently remodeled and includes a master bedroom and remodeled bath along with a comfortable guest bedroom upstairs. Both bedrooms have stunning views of the Pyrenées Mountains. An additional guest bedroom with queen bed, en suite bathroom with shower stall and mountain views is located downstairs. All three bedrooms are equipped with top quality mattresses and linens. Montplaisir features a comfortable salon with fireplace adjacent to a spacious typical French country kitchen and is furnished with country French antique furniture. A front terrace for alfresco dining offers dramatic vistas of the Pyrenées. Dark beamed ceilings and original tile floors lend the house an elegant rustic ambiance. The house is equipped with a 40' HD LCD TV featuring numerous satellite channels in multiple languages (English, French, German, Spanish, etc. )as well as a DVD library of classic movies and a CD player. The wireless router allows for internet access throughout the house as well as FREE WORLDWIDE PHONE SERVICE. Radiators and a large fireplace will keep the place warm and cozy during cool weather. This 14 acre privately-owned property sits on a hill overlooking a verdant valley and stunning mountain views. The area abounds with historical landmarks, museums, walking trails and châteaux. This particular site is noted for its unusual varieties of birds. Access to the area is easy and inexpensive due to the frequent flights into Toulouse Blagnac, an international airport with connections from all over Europe. Carcassone provides inexpensive Ryanair service from Stanstead, Liverpool, Derby and Glasgow. Montplaisir is located about 15 minutes from Mirepoix, an extraordinary Medieval village dating from the 13th century. Food shops as well as a newly renovated supermarket provide everything you could possibly need. The town has numerous restaurants in all price categories offering local dishes at reasonable prices.This part of France, the Ariége, is famous for its cuisine, featuring cassoulet, duck and foie gras as well as its wines, including the Minervois and Corbiéres. On the large central square in Mirepoix you can still admire the half-timbered houses supported on wood pillars, creating a magnificent covered arcade. The ends of the joists of the richest houses are sculpted, and the most beautiful sculptures are on the house of the Justice du Seigneur, which became in 1500 the Maison des Consuls, showing women's faces, bearded heads, a tortoise and other fantastical images. The cathedral of St. Maurice has an unusual nave. Of the cathedrals of Europe only that of Gerona in Spain has a wider nave. Inside, vandalism and demolitions destroyed many treasures but you can still admire a tabernacle, a Christ on the cross from the 14th century and seven paintings by Larivière-Vesontius. This charming, peaceful little town is much appreciated for its mild southern climate and easy access from the airports at Carcassonne and Toulouse. Payments may be made by personal check, credit card, PayPal or bank transfer. - the ancient Romanesque stone church at Vals. - the 14th century Château de Lagarde 'Le petit Versailles du Languedoc'. - Camon, a small fortified village featuring a Benedectine abbey founded by Charlemagne in 778. - the 'book town' Montolieu where you can find rare and unusual books of all kinds. - The famous Cité of Carcassonne. - Toulouse, 'la ville rose', with its numerous restaurants, shops, museums and churches. - Foix, with its extraordinary castle overlooking the entire region. - The fortified village of Cordes-sur-Ciel, northeast of Toulouse. - Albi, with its famous cathedral and Toulouse-Lautrec museum. - The medieval town of Conque about 2 hours away in the Dordogne. Please see guest reviews below. On parle français. 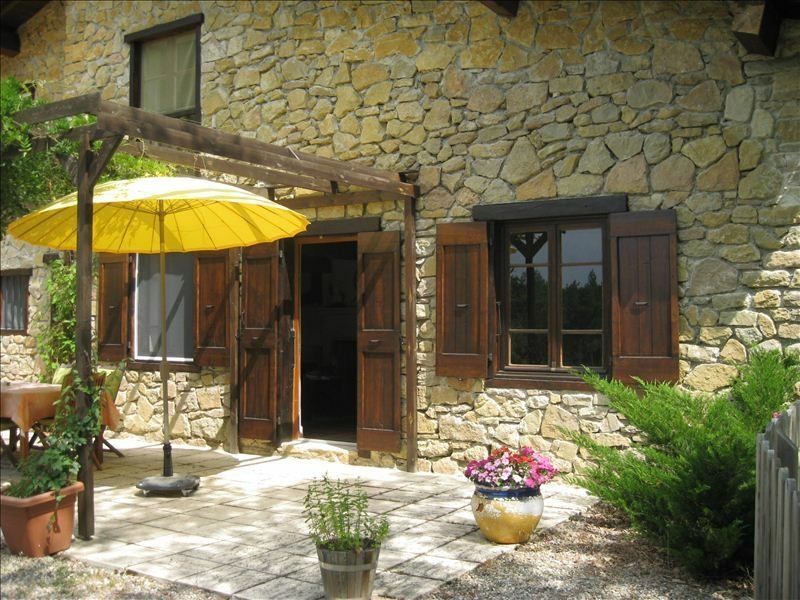 Keywords: Rental house, sleeps 6, 3 bedrooms, free WiFi, satellite tv, quiet, Ariege countryside, retreat, Toulouse, Pamiers, Mirepoix, Carcassonne, Foix, views, lake Montbel, Pyrenées, swimming, boating, hiking, bicycling, horseback riding, museums, castles, historic sites, Corbiere, Minervois, Languedoc-Rousillon, Southwest France. This is a wonderful part of France that remains untouched by the frantic pace of the large cities and Provence. It offers mild weather, great cuisine and delightful wines at bargain prices. We could not find a better vacation spot when we were searching for a retreat from the hectic pace of city life. The rich historical background of this region offers limitless opportunites for exploration. The cathedrals, Cathare ruins, museums and caves keep us occupied during our annual summer stay in Montplaisir. Lac Montbel provides great swimming and boating for our guests and their children. And every year we find something new and exciting. Unobstructed southern view of the Pyrenees mountains. Numerous classic movie DVDs available. Private dining nearby provided by Cordon Bleu chef. We recently had the pleasure of staying in this house for 4 weeks. Waking up every morning to this incredible view and the sound of cow bells is a great way to start your day. I loved the layout of the house. We had several friends join us during our stay and the house handled 6 people very well. The kitchen is well equipped as well. We loved that the house is in the country, it is a short drive to town. We fell in love with Mirepoix. I highly recommend this property. We stayed for a week in this beautiful location. The house was fantastic and had everything we needed. The view of the mountains each morning was something you would never get tired of. The area was very nice to explore and the towns had so much history. We would love to visit again. Exceptional! Bruce's hospitality is second to no one. The house is clean, comfortable, rustic and has everything you need, and everything works. This is a 5 star plus rental. You will not be disappointed . Spring or Fall, Montplaisir is a jewel! If you are looking for a place with a slower pace, this is it. If you are looking for a place that provides a respite from the world outside, this is it. A beautiful setting in a magical area that provides history which pushes your imagination. A warm and welcoming home, fully equipped by western standards, all of the amenities, a functioning fireplace, a stunning view of the Pyrenees mountains, that comes with wonderful neighbors who are the quintessential hospitality ambassadors, plus a local English speaking property manager who doubles as a Cordon Bleu trained chef equally willing to share her kitchen secrets and/or prepare a fabulous meal for you and your friends.. This is our second visit to Montplaisir. When we arrived this time it felt like we were coming home. We brought friends each time. There is plenty of room. To truly experience this area you will want/need a car. Bottom line: this place is the best. If you are fortunate enough to have the opportunity to visit Montplaisir ... don't let the opportunity pass. Montplaisir is perfect for a quiet, relaxing holiday. Our second stay here was like returning home again. This time we enjoyed the views at the lac de Montbel nearby, fabulous Mirepoix of course and the troglodytic church at Vals. An attractive, comfortable, well-equipped house with a large terrace, wifi, donkeys living nearby (albeit shy). It is a very peaceful place with a super view and the sound of birds singing, in fact all you could wish for. The four of us were hoping for a quiet and comfortable place to rest and relax and experience a French lifestyle. This exquisite 3 bedroom cottage was more beautiful than we could imagine. Perfectly decorated and outfitted. One member of our group was a cordon blue chef, and she was in heaven using things the owner had provided! We ate al fresco almost every day, wallowed in the beautiful view of the midi-Pyrenees, and thanked our lucky stars! We will return! Perfection! Owner gave us startup present in insulated bag of milk, coffee, butter, bread, jam and orange juice!!! Very nice touch! Booking may be cancelled up to 90 days prior to arrival with a full refund. After that date no refunds may be made.